Are you looking for the best dinosaur toys for Christmas 2011 and to spend your Christmas money on in 2012? We've got a great selection picked by a Mom to two dinosaur-mad boys. I'm Mom to two boys who love dinosaurs and have done since they were tiny. You'll find lots of great dinosaur toys here for toddlers, preschoolers, little kids and big kids. 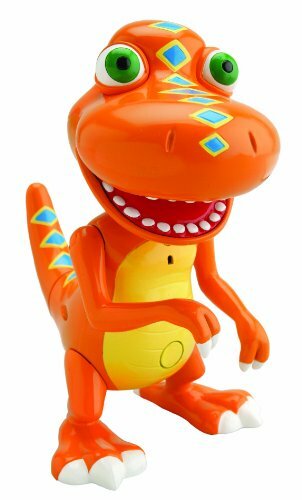 Some of the toys are educational dinosaur toys, some are fun action figure playsets, and others are dinosaur-themed versions of classic toys. If you are buying a gift for a dinosaur fan then you're sure to find something here to suit their age and interests. Melissa & Doug have a brilliant range of dinosaur toys for toddlers, preschoolers and little kids. Young kids are fascinated by dinosaurs and these toys are great quality. Melissa & Doug make great quality toys for younger children. Their range includes lots of wooden toys like jigsaw puzzles, dinosaur stamps and gorgeous dinosaur magnets. Melissa & Doug have dinosaur toys for infants, toddlers, preschoolers and younger children. 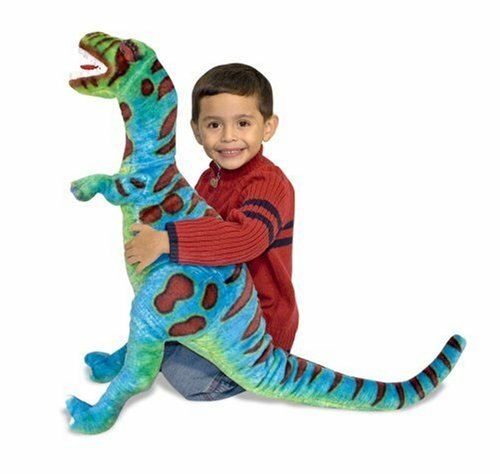 We love the gorgeous Melissa & Doug T-Rex dinosaur plush. He's huge! And the colors are gorgeous. The latest Dinosaur Train Toys for fans of Buddy, Tiny and friends. New Uncle Milton toys that teach science in a fun way as well as the fun Learning Curve toys. There are lots of different Dinosaur Train toys to choose from. The InterAction figures like Buddy here are very popular. They talk and make sounds and move. They are also aware of each other and interact when you have more that one InterAction toy. There are lots more Dinosaur Train toys like train cars, collectible figures, an erupting Smoky Mountain and even Dino Poop! The official Dino Dan Toys are here! Lots of cool brightly colored dinosaurs from the show as action figures. Dino Dan is a TV show featuring 10 year old Dan Henderson. Dan is a paleontologist in training. He sees dinosaurs in everyday life and observes them to learn more about them. The dinosaurs in the Dino Dan show are really brightly colored with interesting patterns. 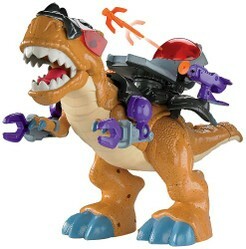 The first Dino Dan toys are available for Christmas 2011 and feature action figures of the dinosaurs from the show. Spinosaurus is a favorite in our house. He's a carnivore with a cool sail on his back. 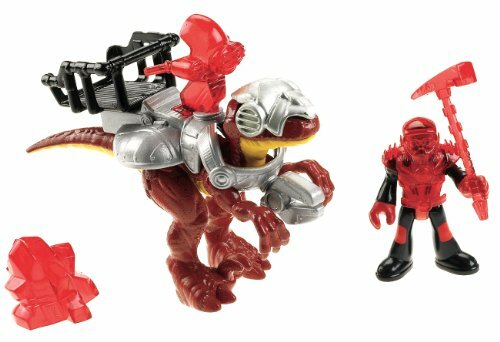 Fisher-Price have come out with a new range of Dino Rider dinosaur action figures. These dinosaurs come from a world where dinosaurs and people live and work together. There are big action figures in the range and smaller ones like this Raptor. He looks very cool in his shiny armor. Red is my older son's favorite color and he loves carnvivores so this set is sure to be a hit. Lots of kids who love dinosaurs get interested in paleontology and dinosaur science. How do we know so much about these ancient creatures? What does a paleontologist do? Paleontology-themed toys are great for encouraging this interest. 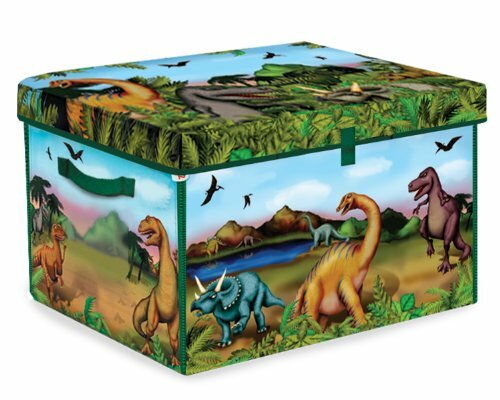 You can get dino dig sets, dinosaur anatomy models and lots more. 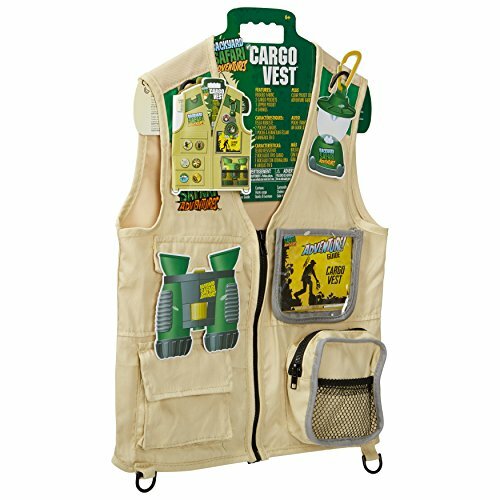 We like the Backyward Safari Cargo Vest for dressing up as a paleontologist, taking your field tools and discovering fossils in the backyard! My boys love to dress up as paleontologist and go exploring.